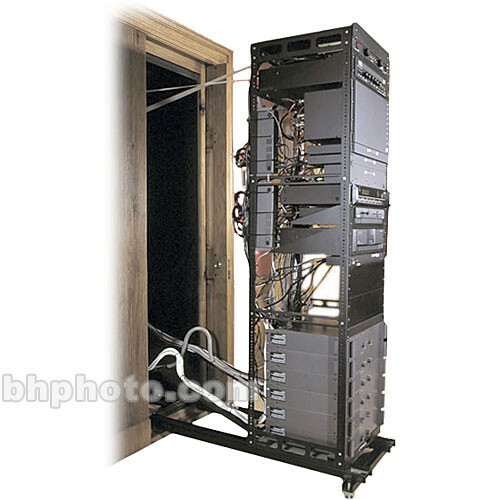 This Middle Atlantic AXS System for Millwork and In-Wall AX-SX-27 is a versatile, high-capacity rack that offers unrestricted rear access to equipment and cabling. Rack mounts on cable tracks and service stand (not included) to create a pull-out frame (25" length extension) that reduces time and labor. The extension can be disconnected for storage. This rack is ideal for flush, in-wall mounting or with the use of custom molding or panels to conceal rack when not being used. All steel construction and mechanically interlocking corners guarantee exceptional strength and years of use. This construction, with heavy-duty, 13-gauge steel top and bottom panels, supports up to 650 lb. of distributed equipment with a total rack capacity of 27U. And a durable, black, powder-coat finish offers a clean aesthetic look perfect for any work environment. Front and rear, fixed-position, 11-gauge threaded, 10-32 rack rails come standard with this model. Its ventilated top accepts up to two fans to ensure proper cooling of equipment. Choose from a wide array of accessory parts to customize and expand your system to meet all your needs: cable management trays, brush gaskets to fill unsightly gaps between the rack and custom millwork, and utility shelves, among many more practical add-ons. All-steel construction and mechanically locking corners guarantee exceptional strength and years of use. Rack mounts on pull-out frame with 25" extension to gain quick, unrestricted access to equipment. All rack rails finished in durable "e-coat" to prevent clogged threads. Rackrail is labeled in EIA standard rackspace increments allowing for easy equipment alignment. Pick and choose from Middle Atlantic's wide range of accessories to customize and expand your rack system. Pre-installed washers on all 10-32 threaded rackscrews save installation time. Grounding/Bonding Studs have been provided to help you electrically ground and bond equipment, per NEBS and NEC standards. RackTools free layout and specification software included for effective system design help.